What a treat it is to be back in a place where I can choose my theatregoing based on the venue’s reputation – and my previous experiences seeing shows there – rather than the title itself. That’s just what I did for two plays yesterday at the Royal Court and Almeida theatres at opposite ends of London. I joined the legions of tube and on foot commuters in the interim period with an extended stop at Leicester Square, which just happened to be on full showman mode with the UK premiere of Cinderella. But back to the plays. 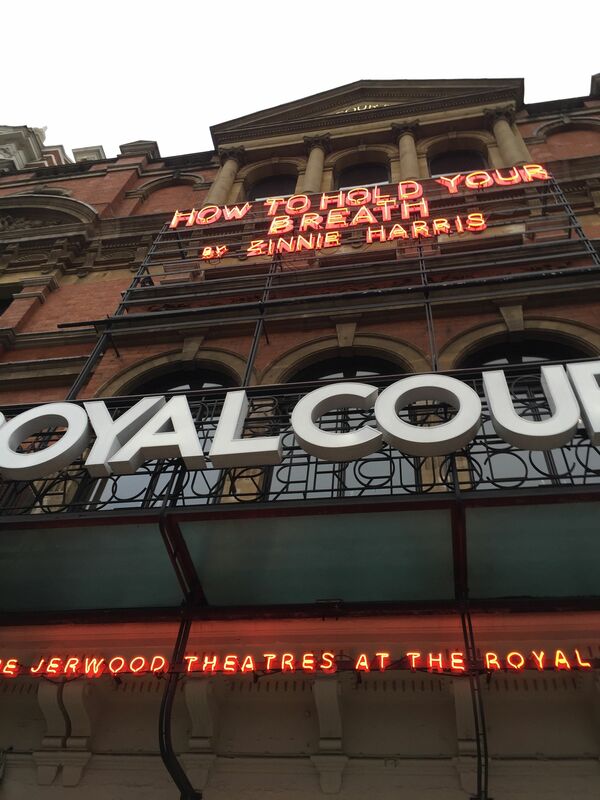 First up was How To Hold Your Breath, running at the Royal Court. In some ways it was difficult to follow exactly what was going on in this story, but as the tale went on, it became clear that was part of the point. We’re introduced to Dana (Maxine Peake), a woman who appears to be in her 30’s or 40’s and is struggling to make ends meet. In the beginning of the story, she may or may not have sold herself for romance with Jarron (Michael Shaeffer), but (since this is a play!) they have an argument that sets the plot in motion and leads to Dana thinking that Jarron also holds supernatural powers which haunt her as the story goes on. Dana brings her sister and roommate Jasmine (Christine Bottomley) into the action, and is trailed by a mysterious librarian (Peter Forbes) as her journey goes on. The supernatural thread expands with the story, leading to a series of arresting and memorable physical images near the climax when Dana is isolated against an army of people also suffering from her plight. Because the plot meandered from point to point, it was difficult to tell when the conclusion was being set up and led to the story feeling anticlimactic for me – it would have surely been more effective with a dramatic denouement in the image described above, for instance. However, the design team offered a crackerjack sense of compactness, with backdrops rising on top of each other in the modestly sized Royal Court stage, and effective hints of sound design sprinkled throughout the narrative. When the script by Zinnie Harris played with its lines and a sense of repetition, also near the end, that also created a feeling of taut anxiety and uncertainty. Although in a broader sense the play remained successful simply from showing two strong female leads and the sense of a realistic world nestled within current events. In the evening I ventured back up to the Almeida Theatre in north-central London’s Islington district. Their current production, Game, drew me in with its promise of a unique viewing experience, and convenient “late show” 9:30pm start – the performances are actually twice per night because it’s a short length play. The show has drawn strong reviews from all major local sources. The show takes a provocative premise and really runs with it. We’re introduced to a young couple moving into an affordable house and getting to know their new living quarters. But it immediately becomes apparent that their presence in the house is part of a sadistic plot for members of the public to improve their shooting skills. In a sharply constructed 60 minute viewing experience, we’re given a sense of what the couple must endure to live in that environment and how their efforts to live a “normal” life are severely compromised. Although the voyeuristic shooters remain somewhat thinly drawn, they get a moral conscience with one character who rises in importance during the story. I’m sure I will remember the show most for the novelty of its staging, in which the Almeida’s modestly sized auditorium was reworked into a series of arcade style viewing experiences, with the audience (divided into three or four separate sections) seated on backless benches looking in at the central set. Viewing was also augmented by medium sized televisions above the set, and all of the scenes not involving the couple took place in areas that are part of the audience seating area, with the images being transmitted to those in other sections. Finally, the audio of the experience was through headphones rather than live listening, and the actors had to expertly coordinate between their lines onstage and off, and sometimes overlapping. It’s clear that the writer, Mike Bartlett, intended for his piece to be cultural commentary in our ever – expanding age of reality shows and celebrity obsession. I would say that he and the design team, led by director Sacha Wares, succeed in balancing a sense of satire and one of nervous drama. While it’s possible this show experience would be different if it was a longer or less radically conceived piece, I think it was right in tune with the challenges of today and how things could turn if we collectively don’t take more humane charge of our future lives. Posted on March 20, 2015, in Theatre and tagged almeida theatre, london, london theatre, london theatregoing, mike bartlett, new plays, nostalgia, royal court theatre. Bookmark the permalink. Leave a comment.